I’m just a tiny bit obsessed with adding real gold leaf to my calligraphy, and I’m now offering a bespoke service to those who fancy having some bling of their own. Please feel free to email me to order a favoured letter, word, or phrase. I use modern gilding techniques meaning that no hazardous materials, such as white lead, are used in the making of my pieces. I use an acrylic based mordant and genuine 22 carat gold leaf. Although I use a modern technique this does not equate with being quick and easy! Each piece of work can take anything from a week to two weeks to complete depending on humidity and how raised I want the lettering to be. 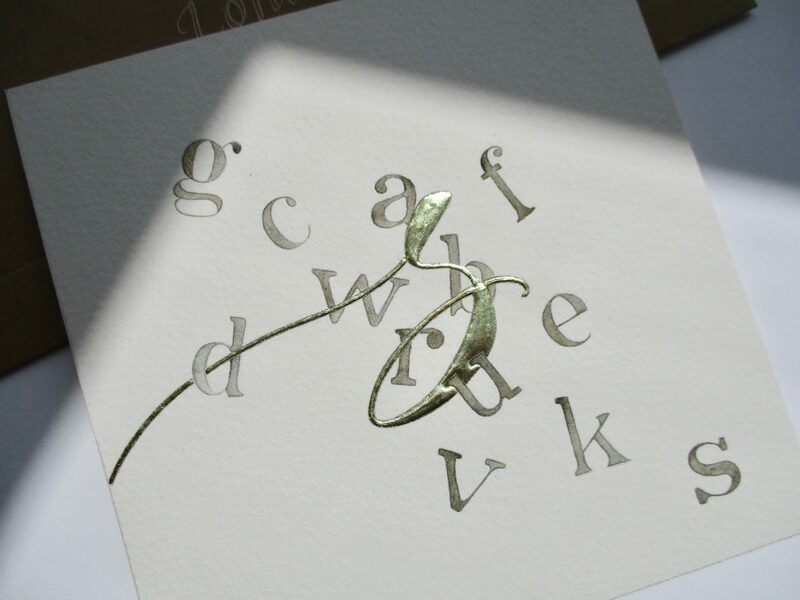 Individual letters are gilded on 15cm x 15cm heavy water-colour paper and are built up with several layers of size to give a raised effect. Each layer has to dry before another is added hence these pieces can take time to complete. Due to their obvious longer length words and phrases can be even more time-consuming. Usually they begin life on an A3 sheet of water-colour paper and then are cut down to size if necessary. They are surprisingly large and a labour of love!